Gedney Information Board » The Wash and North Norfolk Marine Partnership. 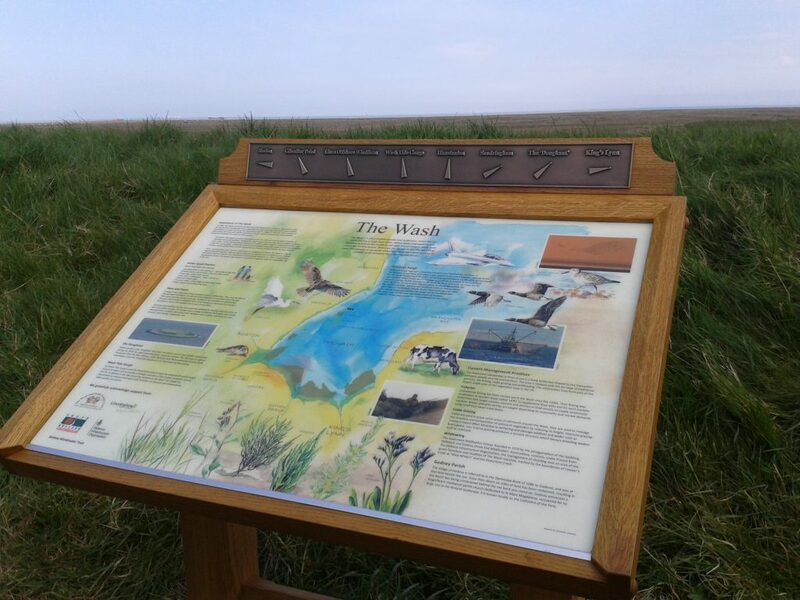 On Wednesday 13th April 2016, an information board made of an English oak, which celebrates the unique wildlife, history and cultural importance of The Wash was unveiled on the sea bank at Gedney, Lincolnshire. The information board was the idea of retired Gedney Parish Councillor Hugh Piggins, who thought that it is important for visitors and locals to have readily accessible information explaining the importance of The Wash. The board is situated on the sea bank south of the Air Traffic Control tower at Holbeach Air Weapons Range, Gedney. Hugh Piggins is a member of the Holbeach Range Conservation Group that meets every six months to support nature related decision making at Holbeach Air Weapons Range. The group is made up of representatives from various nature based organisations including local wildfowling groups, Natural England, Environment Agency, Lincolnshire Wildlife Trust, RSPB, Eastern Inshore Fisheries and Conservation Authority, South Holland District Council, Gedney Parish Council and The Wash and North Norfolk Marine Partnership. The project was managed by The Wash and North Norfolk Marine Partnership and the Defence Infrastructure Organisation, and funded by the Gedney Windcluster Trust, South Holland District Council, and Lincolnshire County Council. Harry Stebbing’s workshop was commissioned to construct the board and Samantha Symonds carried out the illustration and design.